1: Gladys McManus, 1920. Mont Amoena. 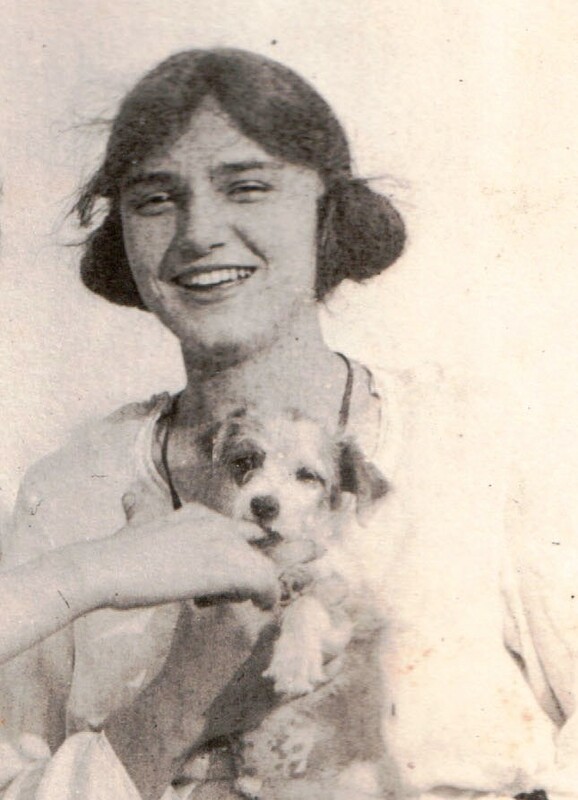 2: Gladys McManus, 6 May 1926. Mont Amoena. 3: The State (Columbia, SC), 14 Aug, 1950, p.15. 4: Charleston News and Courier (Charleston, SC), 24 Jun 1951, p. 37. 5: The State (Columbia, SC) 7 Nov 1950, p. 26. Photo 3: The State (Columbia, SC), 14 Aug, 1950, p.15. 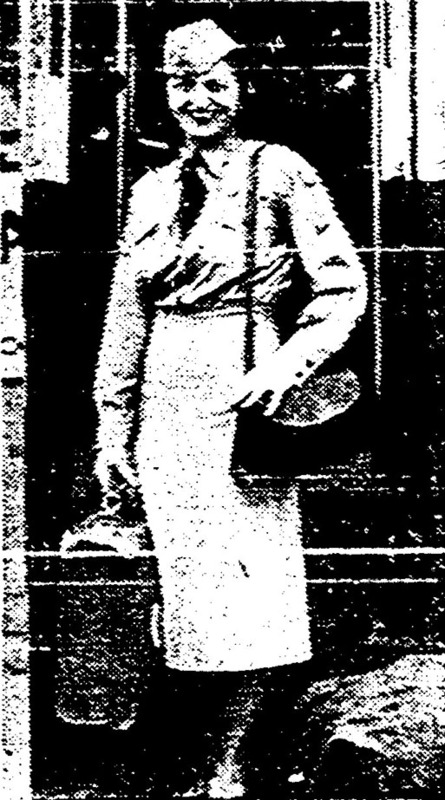 Corporal Gladys McManus, first of a contingent of WACs to be assigned to Fort Jackson since its reactivation, is shown alighting from a bus at the post as whe preapares to report for duty. Corpral McManus enlisted at Fort Jackson seven years ago. Photo 4: Charleston News and Courier (Charleston, SC), 24 Jun 1951, p. 37. Career woman in Khaki – S/Sgt. Gladys M. McManus is shown on the job in her assignment as mess sergeant for the Fort Jackson detachment of the Woman’s Army corps. She enlisted at Jackson nine years ago, and has since served in numerous posts in this country and at overseas stations in Germany. the Cheraw native plans to make the army her career from now on, and has signed up for an “indefinite extension” of her enlistment. (U. S. Army Photograph. Charleston News and Courier (Charleston, SC), Jan. 10, 1943, p. 9. Cheraw, Jan. 9. – Special: Miss Sarah Page Murray, who has been accepted by the WAACs, has received orders to report January 27, at Daytona Beach, Fla. Miss Gladys McManus, another Cheraw girl, who joined a few weeks ago, is at Daytona Beach. The State (Columbia, SC), August 14, 1950, p. 15. Corporal McManus is a South Carolinian. Her previous assignment was in the WAC supply section at Fort Bragg, N. C. Corporal McManus’ military history includes seven years of service, beginning with her enlistment at Fort Jackson in 1942 and followed by the prescribed period of basic training taken at Daytona Beach, Fla. Two years of her service period were spent overseas, where she performed the duties of personnel clerk in the Personnel Office of the Constabulary school at Sonthoften, Germany. Charleston News and Courier (Charleston, SC), June 24, 1951, p. 37. FORT JACKSON, June 23 – Nine years ago, a young woman from Cheraw signed on the dotted line at Fort Jackson and became one of the early South Carolinians in the brand new Woman’s Army Corps. Today, as S/Sgt. Gladys M. McManus, she is back at Fort Jackson, serving as mess sergeant for some 60 members of the WAC detachment at the post. During these last nine years, she has seen a good bit of the United States, and Europe, worked at various jobs in the army, taken an 11-month break as a civilian, and is now back in uniform for good. From now on out the army is her career, and, within that career she hopes to stick to mess management. Sgt. 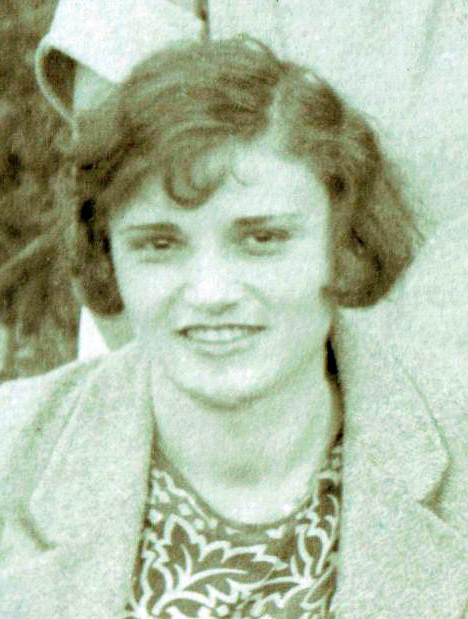 McManus was working in Cheraw in 1942 when she decided to join the WACs. Her parents, Mr. and Mrs. S. T. A. McManus, had died and she was helping operate the Wilson Springs resort near Cheraw. Prior to that, she had attended Mont Amoena Seminary, at Mount Pleasant, N. C., and for two years, Greenville Woman’s College (now joined with Furman University). After enlisting at Fort Jackson, she was sent to Daytona Beach for her basic training, and from there drew an assignment in personnel work at Fort Dix, N. J. As a private, first class, she stayed there until October of 1945, and then was discharged as World War II came to a close. For some months therafter she visited with her brother, Dr. C. H. McManus, in Sumter, and a sister, Mrs. R. S. Spence, in Nashville. 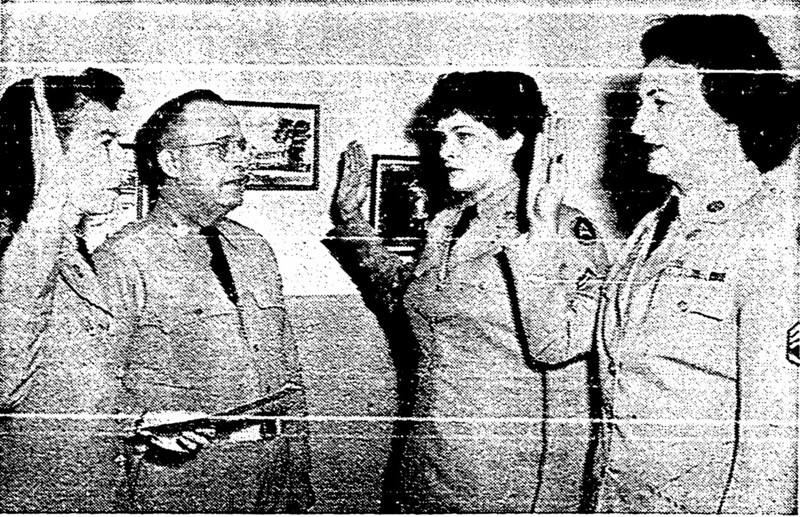 Meanwhile, she felt the urge to get back in uniform and in September of 1946 she re-enlisted at Fort Oglethorpe, Ga., volunteering for overseas service. Her first overseas assignment was at Sonthofen, Germany, where she was in personnel work at the school for the United States Army Constabulary. During her year and half in that job, she had opportunity to take travel leave about the continent and saw seven different countries, enough to make Europe her choice for any future overseas assignment. Later she was transferred to Stuttgart and remained there for some six months preceding her return to the United States. That return, incidentally, marks one of the high spots of her military life, for she came back by air across the North Atlantic from Frankfurt via Iceland and Newfoundland to Westover Field, Mass. Subsequent assignments, all in personnel work took her to Fort Knox, Ky., Fort Meade, Md., and thence to the WAC Training Center at Fort Lee, Va. After a year there, she joined a supply cadre at the Army Finance School at St. Louis and was ordered to Fort Bragg (nearest WAC station to South Carolina at the time). When Fort Jackson was reactivated last year and the army began ordering WAC personnel to the post, then Corporal McManus was the first to arrive. 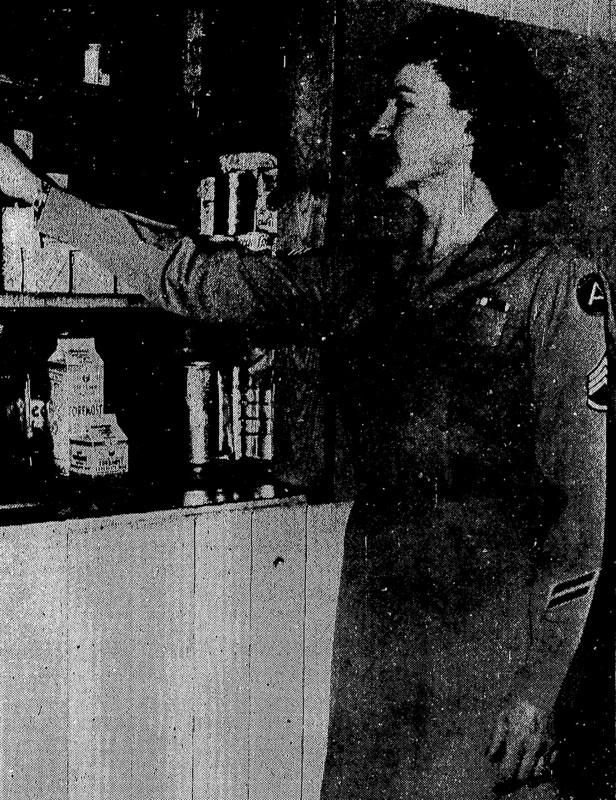 In the role of supply sergeant, she helped establish the WAC detachment at Fort Jackson and subsequently was promoted to staff sergeant and assigned mess sergeant. Since the, she has signed up for an “indefinite extension” of her enlistment and is looking forward to continued enjoyment and usefulness as one of Uncle Sam’s girls in khaki. The State (Columbia, SC), 19 Nov 1953, p.8. Sergeant First Class Gladys M. McManus, 817 Maple St., Columbia, S. C., the first WAC to arrive at Fort Jackson when the WAC Detachment was assigned her in August of 1950, recently was awarded the Bronze Clasp to the Good Conduct medal. Sergeant McManus, formerly of Cheraw, S. C., was awarded the medal for “exemplary behavior, efficiency and fidelity” during the period of April 1949 to April 1952. Sergeant McManus is assigned to the Food Service School at Fort Jackson. She entered the Army in October of 1942 and has spent two years in Germany during the occupation. Before coming into service she attended Montamoena [sic] Seminary, Mt. Pleasant, N. C., for five years and Greenville Woman’s College, Greenville, S. C., for two years.